Over the last week I have been struck with the dreaded "blogger's block" (as well as one of the most irritating coughs I have ever had, but we won't get into that...). I'm sure a lot of writers know how I feel when I say you just feel a bit meh and to be quite frank, forcing a blog post isn't healthy or ideal when you're in that mindset - but don't fear I'm back. 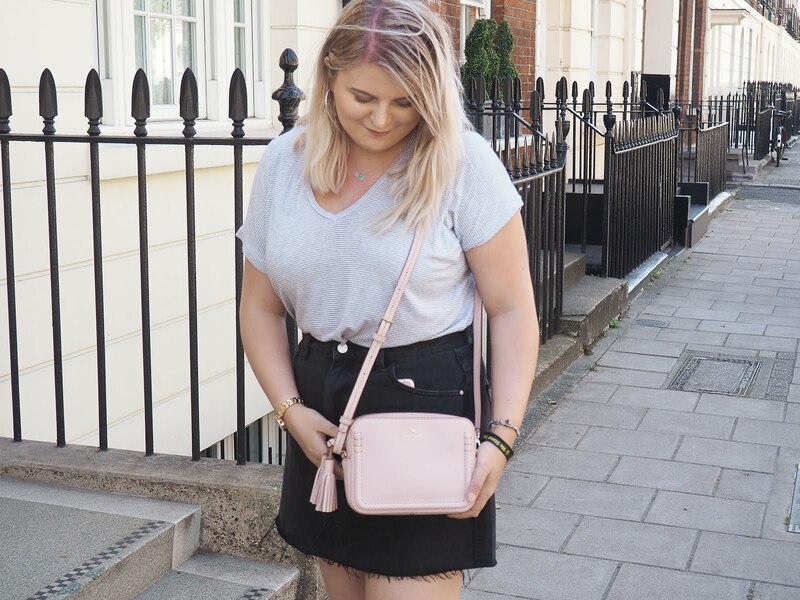 As you have probably already fathomed, I fancied writing more of a chattier and informal post so I've gone back to my roots and decided to write about what I know best, ME! Apparently these sort of posts are quite popular? There's little old me thinking I came up with something brand new and original... Nope, think again Kathryn! Nevertheless here's the A-Z of me. A is for Autumn - I mean if anyone reading this knows me, are you really surprised that I chose Autumn? Probably not. It's my absolute favourite season, the fashion, darker make up, seasonal drinks... Need I say more?! B is for Baking - Baking is one of the hobbies that has been with me since I was little. I remember baking with my mum on a Sunday, well my job was licking the bowl but still, I enjoyed it! Watch out Mary Berry. C is Coffee - Iced coffee, caramel lattes, pumpkin spice lattes... if it contains coffee, I will most likely love it. It also makes me feel less zombie-like, always a bonus. D is for Disney - Like most people my age, I grew up watching the Disney Classics... I have fond memories of driving my grandma and grandpa crazy due to the number of times I had Sleeping Beauty or Cinderella on repeat. Then along came Disney Pixar, the likes of Toy Story, Monsters Inc and Finding Nemo took over and I was hooked! Monsters Inc is still my favourite Disney film to this day - I have stuffed Sulley plushies and Mike Wazowski cups everywhere. E is for Ezra Fitz - Calling all PLL fans, you'll know what I mean. If you don't know who he is, then just Google him, you won't regret it. F is for Feminism - Feminism is extremely important in this day and age and I'm glad it's something I have learnt more and more about over the past year. I mean why wouldn't you want to support equality of the sexes? G is for Guinea Pigs - Not a lot of people know that I own two lil guinea pigs, Bubble and Squeak. I was thinking about writing a post about them, they're too cute to not have a feature on my blog. I purchased them last year and although they are very needy, they make my day that little bit better. H is for Harry Potter - Like Disney, I also grew up with Harry Potter. If I wasn't reading the books, I was watching the films until I knew them off by heart or playing the PC games. I like to think of Harry Potter as my escape as the stories never fail to cheer me up. I plan to get the Deathly Hallows symbol tattooed on me fairly soon and I know I won't regret it! I is for Internet - Without the internet, life would be dull, let's face it. Due to the internet I have met so many incredible friends and it has completely changed my life. Thank you internet. J is for Jingle Bells - (Thanks Gem) I am THE biggest Christmas fanatic, like I will be in the mood for it as soon as September arrives. The lights, smells and food makes everything feel so magical! It's an excuse to do excessive shopping which is never a bad thing. K is for Kardashians - Love them or hate them, they're the social media queens. Personally, I love them and KUWTK is one of my favourite shows. I just find them so entertaining. L is for London - I love London, most people know this, mainly because I'm constantly talking about it. It's just a really incredible city to me and so different to anywhere I have ever visited. M is for Make up - I only really got into make up when I started college, that was the time when people were beginning to be accepted for uploading videos of themselves talking about a tube of concealer and Primark's fluffy socks. I now consider make up a hobby of mine, whether it's collecting or researching, it's just so fun! N is for Nursing - Nursing has been something I have been passionate about making my career since I can remember. This year I'll be applying to Uni for Mental Health Nursing and hopefully it'll be the start of a new chapter in my life. I am so determined to use my life to better and help others in any way I can. O is for Ozzy - My best buddy, my dog. Everyone loves Ozzy! There's not much I can say really but he is the cutest bundle of fluff and made a cameo in my previous post which you can find here! P is for Pizza - Obviously I had to slip pizza in here somewhere. I don't know what it is but I just have a constant craving for those doughy circles of heaven. Give me a stuffed crust Dominos anyday and I will be your friend for life (but it must be a Hawaiian, you have been warned). Q is for Quiet time - I love nothing more than to be on my own, with my blog and relax. I normally get quite frustrated if I don't have something to do but it's important to remember that self care is essential. We all need a bit of time to recharge our batteries. R is for Rose Gold - Rose gold is my favourite colour (is it even a proper colour? I don't know) and if I could have rose gold everything, I would. S is for Sloths - Sloths may creep some people out, but not me! They are frickin' adorable, have you heard the noises they make?! Adopting a sloth is definitely high on my bucket list. T is for Take That - If you saw my Eight Photos of Happiness tag, you will know how much this band mean to me so I'll save the rambles and let you head over to that post. For the record, they are really great. U is for Underground - U is a tricky letter, so I chose underground, as in the tube. I bloody love the tube and the way it just whizzes you halfway across London in a couple of minutes. I'm not fond of rush hour but I always manage to avoid that so no problems here! V is for Vindaloo - The one food I just will not eat is curry. I think it's because I wasn't brought up on spicy food so I'm not used to the flavours and I'm not good with trying new things. It's a no from me. W is for Writing - Blogging lead me to rediscover my love for writing and I am so grateful for that. It's comforting being able to put all my thoughts and daydreams together to create my blog and have it as something I can be proud of. X is for X Factor - It's a fix, blah, blah, blah! I don't care about that, it makes great Saturday night TV. The live shows mean it's the run up to Christmas and let's be fair, it is pretty entertaining. Y is for YouTube - What would we do without YouTube? I've learnt more from watching videos on there than I did at school. It has everything, from learning how to make the perfect boiled eggs to make up tutorials and DIY's! YouTube can be lethal though, I'm talking when you only mean to watch one video and two hours later you're watching compilations of cats. Z is for Zoeva - The Zoeva brushes have been on my wish list for SO long! Referring to my earlier mention of rose gold, the Zoeva Rose Gold brushes are the ones I've had my eye on. Make up brushes are such essentials these days, they literally transform how your make up sits on your face. I could sign under any of those letters!! Love your answers, esp J, A, C, S, L and all the other letters lol. Thank you! Oh god I could never think of 50 facts about myself, I struggled with 26. I love this post idea! Never seen it done before and it's such a good way to help your readers get to know you a little! Might have to do this myself if you don't mind! Feel free to do it, I'd love to read yours! I've nominated you for a Liebster award. Head here to see the nomination! I loved this post, the way you go through each letter in such a chatty & personal way is great! I really need to try some Zoeva brushes! It was a struggle not gonna lie! I had to ask my friend for help a couple of times, turns out she knows me better than I know myself! I absolutely love this A-Z! Jingle Bells: YES YES YES! Loved reading this. Awh I loved reading this - really good post idea! Would it be alright if I used this post idea and did one on my blog as well? I'll of course mention your blog and that you gave me the idea! Haha Bubble and Squeak are such CUTE NAMES - you should definitely talk about them more ;) if I had a blogger's block, I wouldn't even bother posting 'cause I'm that lazy but you keep it up girlie! Bubble and Squeak are quite the charmers, they NEED their own post to be honest! Good luck with the mental nursing degree, it sounds like such an amazing job! I've always loved baking too, I love baking a batch of cookies or cupcakes on a Sunday afternoon! Yay for our dogs having matching names, so cute! what would we do with the internet and YouTube.. and Harry Potter.. The world would be a dull place! This is such a lovely post idea. I love Disney and PLL too!! Loved this post, great to get to know the girl behind the blog. YES SO DISAPPOINTED. My theory is though that it isn't who they revealed it as, and she's covering for someone... because let's be real, they haven't fully told us the truth in any other season finale so why would they now?! I really enjoyed reading this hun!